P. Hallensleben, H. J. Schaar, P. Thome, N. Jöns, A. Jafarizadeh, I. Steinbach, G. Eggeler, J. Frenzel. 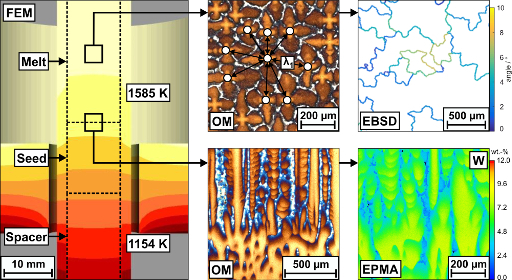 Illustration of the calculated temperature fields in the melt feedstock with the corresponding experimentally observed dendritic microstructures (OM = Optical Microscope). The present work takes a new look at a modified Bridgman process (Bridgman seed technique, BST) for the production of laboratory Ni-base single crystal (SX) superalloy cylinders of 12/120 mm diameter/length. This type of specimen is needed to perform inexpensive parametric studies for the development of new SX and for understanding the evolution of microstructures during SX casting. During melting, the seed partially melts back. The elementary segregation processes cause a so far unknown type of constitutional heating/cooling. Competitive growth eventually establishes a constant average dendrite spacing. In the present work it is documented how this dendrite spacing varies in one cylindrical ingot, and how it scatters when a series of SX ingots is produced. This type of information is scarce. The calculated temperature gradient across the solid/liquid interface (calculated by FEM) is in excellent agreement with predictions from the Kurz-Fisher equation which yields a dendrite spacing based on the experimental withdrawal rate and the microstructurally determined average dendrite spacing. The presence of small angle grain boundaries on cross sections which were taken perpendicular to the solidification direction can be rationalized on the basis of small deviations from the ideal growth directions of individual primary dendrites.